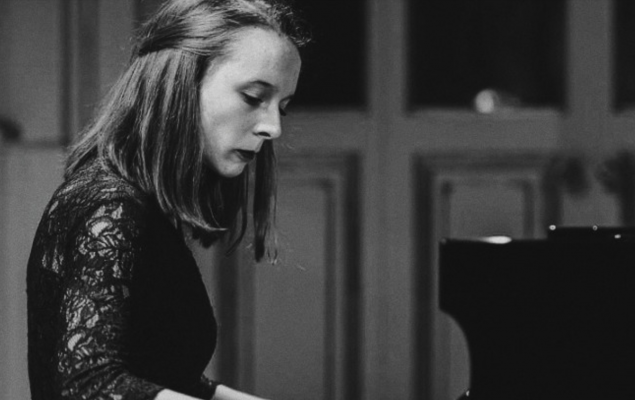 I am delighted to share with you that a very talented young pianist Klara Lužnik from Slovenia will be performing at the Elena Cobb Star Prize Event at the Royal Albert Hall (Elgar Room) on 5 April. Klara is seventeen years old pianist who currently studies the piano under Professor Planinka Jurišić Atić at the Konservatorij za glasbo in balet Maribor. She started learning to play the piano at the age of seven and since then, she always enjoyed every opportunity to perform in competitions and concerts. Klara shared with us that “she loves being on stage” and we very much looking forward to her world premiere performance of Matryoshka from the Album for the Young by Irina Nenartovich. Klara Lužnik & Dora Mališ perform W. A. Mozart: Sonata, KV 358, II. Adagio, III. Molto presto at the IC Davorin Jenko 2017 in Belgrade. There are many fine musicians in Germany and we are delighted to welcome three students of Irina Woronow to Elena Cobb Star Prize event at the Royal Albert Hall (Elgar Room) on 5 April. Irina Woronow, Germany is a piano teacher, educator and presenter who graduated from the Moscow State Tchaikovsky Conservatory, the Kazakh National University of Arts and the State College of Music and Performing Arts in Mannheim. She is the author of the popular piano method book Verliebte Giraffe and workbooks Klavierdetektiv for young beginners. Nicole is a nine years old girl who as a toddler spent hours pretending to play concerts on her toy piano. When Nicole turned four, she was enrolled at the Leiningerland music school where she now learns to play the real piano with Ms Woronow since 2015. Nicole was very excited to travel to France with the school orchestra last year and now very much looking forward to her piano trip to London. Deva is a ten years old girl who lives with her family in Manheim. She started her music education at the Musikschule Leiningerland in Gruenstadt at the age of four. Deva soon discovered her great enthusiasm for learning to play the piano and for the last three years she studies with Irina Woronow. Deva is planning to become a veterinary surgeon and in her spare time, she enjoys playing with her dog and horse riding. Deva shared with us that she is very excited about her upcoming trip to London! Christian started his lessons with Ms Woronow in 2014 and since then, he became a keen piano player who enjoys performing in competitions and festivals. In addition to his piano solo lessons, Christian also plays the piano with the Elisabeth von Thadden School Orchestra Gymnasium in Heidelberg. A group of four very talented young pianists from the Albuquerque Institute of Music, New Mexico, US, will be crossing the Atlantic Ocean for the Elena Cobb Star Prize Winners Concert and Showcase Recital at the Royal Albert Hall on April 5, 2018. The Albuquerque Institute of Music was founded in 2016 by Tatyana Bayliyeva and now offers piano, voice, guitar, violin and music theory lessons at school or via Skype to students of all ages and levels. Located in Albuquerque, New Mexico, the institute is a lively community of students and teachers who enjoy bi-annual recitals as well as many solo recitals throughout the year. The institute is a member of the National Piano Guild and enters students for Trinity College London theory and practical examinations as well as offers a variety of masterclasses. 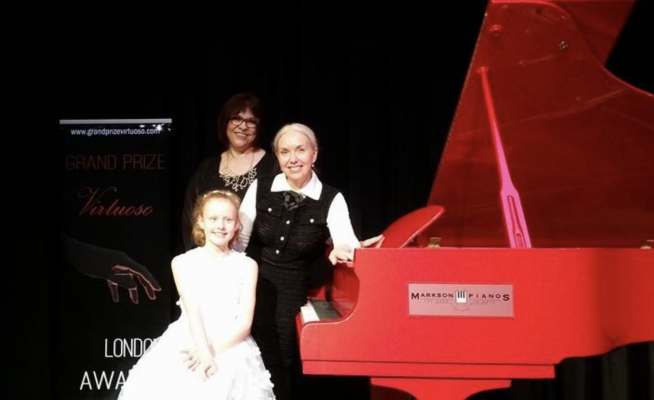 All students have an opportunity to share their musical talent with the local community and to participate in the state, national and international piano competitions and there are many who have won prizes at several prestigious competitions both Nationally and Internationally. 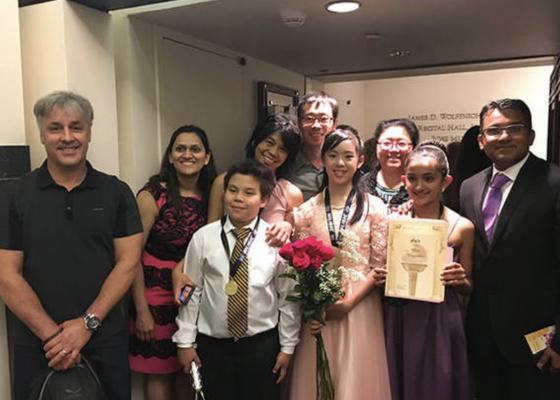 During their piano trip to London, students will be accompanied by their piano pedagogue Tatyana Bayliyeva and a support team of family and friends. Todd is a nine years old boy from Albuquerque in New Mexico. He started learning to play the piano at the age of seven and since then, Todd never missed an opportunity to perform in public. In addition to piano, Todd also loves swimming, reading and enjoys solving Olympic Math puzzles. Todd Miao performs Penguins by Andrew Higgins at the Professional Music Teachers of New Mexico Central District Honors Auditions, 2017. Christina was born in Columbus in Ohio in 2009 and started learning to play the piano at the age of five. She loves performing and is a frequent guest in the piano recitals for the Community Services for elderly people in her hometown. 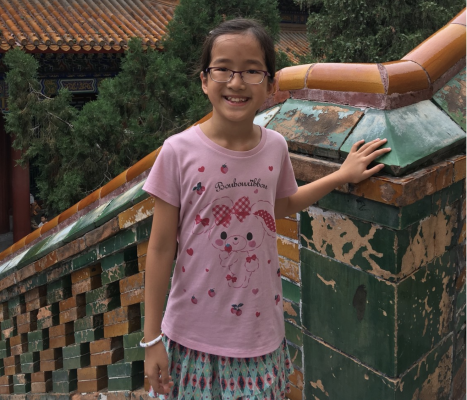 In addition to piano, Christina finds time to go swimming, playing chess and competing in gymnastics for which she won several medals. Ovie Nirgudkar is a talented young pianist who discovered her love for piano at the young age of four. In the summer of 2017, Ovie gave a solo recital to a sold-out audience in India. Besides playing the piano, she enjoys reading, swimming and drawing. Carnegie Hall: as a winner of the American Protégé International Piano and Strings Competition and the Golden Key Music Festival, Ovie has performed three times at this prestigious venue in New York. Ivan Belyaev began learning to play the piano at the age of five and from 2012, he attends music and theory lessons at the Albuquerque Institute of Music. 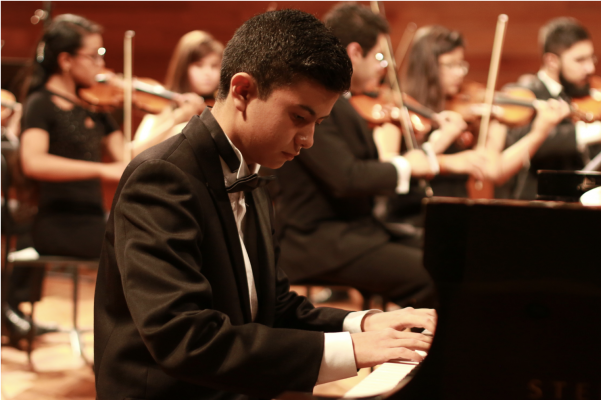 Ivan enjoys working towards the Trinity College London exams, enthusiastically participates in piano competitions and takes every opportunity to perform in public. In addition to his piano studies, Ivan is a keen sportsman with interest in competitive chess, tennis and archery. Ivan performs Arabia Etude-Tableau by E.Cobb at the Golden Key Music Festival & Award Ceremony in Vienna, 2017. In the concert, Finlay will be performing Sunday from Daily Expressions by Paul Birchall (EVC). I also would like to say a heartfelt thank you to the organisers of the Southend Musical Festival and especially to Jena Pang, for including our classes in the festival programme for the 3rd year running. Southend Musical Festival is a member of the British and International Federation of Festivals. 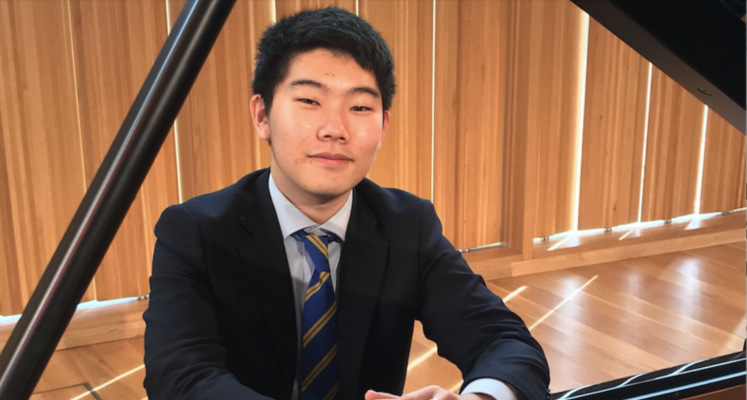 In today’s world, anything is possible, it seems and I am delighted to note that a young pianist from South Korea will be joining the International team of performers at the Elena Cobb Star Prize event at the Royal Albert Hall (Elgar Room) on 5 April. David Choo was born in South Korea and currently is a student at Stowe school in Buckinghamshire. David started learning the piano at the age of ten with Petra Reichel and he has always enjoyed had a passion for performing. David shared with us that he delighted to be taking part in the Elena Cobb Star Prize Winners Concert in April where he will be giving a premiere performance of the Idaho Suite by Christopher Norton. At the age of just 11 years old David took part in his first music competition in South Korea, where he won 3rd prize for his performance of Chopin’s Fantasie Impromptu. Since then, David has won prizes in several competitions both here and abroad. David was recently awarded a music scholarship at Stowe school, where he studies with Ben Andrew. Before moving to the UK, David lived in Vienna, where he was a music scholar at Amadeus International of School of Music, where he studied with Paul Gulda (son of Friedrich Gulda) and Jazz lessons with Otmar Binder. During his time in Vienna, David gained a great deal of performance experience, performing at venues such as Musikverein Glasshall, St. Peters Church and St. Stephans Cathedral, with the latter as part of a choral concert. David has also given recitals in China and Singapore and he has taken part in several charity fund-raising concerts. Recent events include a performing at St Lawrence Jewry church, London and several solo recitals and a concerto performance at Stowe school. 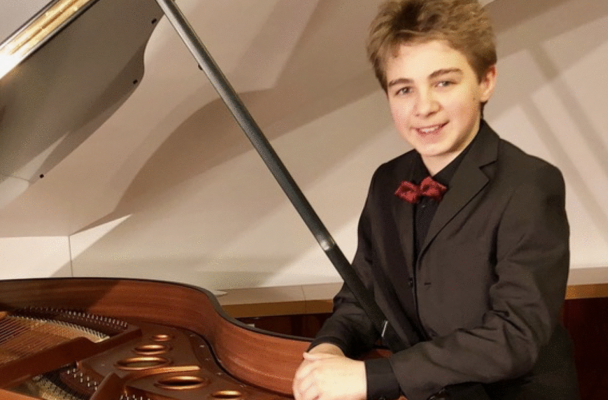 No distance is too far for this young pianist as he and his family will be travelling to Elena Cobb Star Prize Event at the Royal Albert Hall (Elgar Room) on 5 April all away from South America. I am delighted to introduce you to Julian Rodríguez! Julian was born on October 17, 2002 in Bogotá, Colombia. He began his music studies in 2006, choosing the piano as the main instrument. Julian is a keen performer and played on different stages since 2007 with his first performance at the Camarín del Carmen Theater, in Bogotá, and later at the Olav Roots auditorium of the National University of Colombia and at the Amira de la Rosa Theater in Barranquilla. 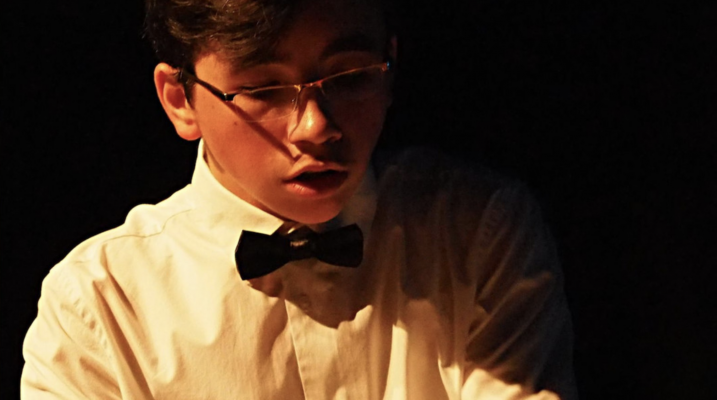 Currently, Julian is a student at the Juliana Reinat Piano Studio in Colombia and often takes part in competitions for young pianists in Colombia and the United States. His repertoire includes a wide variety of classical, contemporary and Colombian folk music. Julian enjoys performing as a soloist as well as playing with symphony orchestras. He is passionate about the piano but he also finds time for other instruments such as accordion and guitar. Julian Rodríguez performs Peacock Grande Valse by E. Cobb and Germán Darío Pérez S. Ancestro (Bambuco) at the Carmel Klavier International Piano Competition, Indianapolis, USA in 2017. 2016 performed the Joseph Haydn´s Concerto in D Major, Hob XVIII/11 for piano and orchestra at the Fabio Lozano Theater in Bogotá, Colombia. 2015 performed contemporary music for piano and orchestra at the Amira de la Rosa Theater, in Barranquilla, Colombia. Julia is a talented young musician and pianist from Friedberg, Germany. She was born in November 2005 in Bad Nauheim. Julia discovered her love for playing the piano at the age of five when she began her piano lessons at the Musikschule Minz with Irina Mints. Now, at the age of eleven, Julia has already performed in the finest concert halls in Europe and America: the Royal Albert Hall in London, the Laeiszhalle in Hamburg, the Gasteig in Munich, Wiener Musikverein, the Palladium Concert Hall (Carmel) and Carnegie Hall (debut performance with orchestra) in the USA. She attends Ballet school, plays chess and sings in the school choir. Julia loves listening to classical and modern music and spending time with her family and friends. Julia performs Arabia Étude-Tableau by Elena Cobb. Ben Yakoubov was born on August 25th, 2003 in Ashkelon, Israel. In 2012, in recognition of his musical gift, he was awarded the America-Israel Cultural Foundation’s scholarship to study piano at the Ashkelon Conservatory, where he is a student of Tamara Yusman. Ben is a keen performer and often appears in festivals and concerts as a soloist or with the orchestra in Israel and abroad. In addition to his main studies of the classical piano, Ben also enjoys playing jazz and drums. Alexander Anderson who is now twelve years old started to learn to play piano at the age of seven. Within two years, he made an exceptionally good progress and Alla decided to enter him to take part in the Around The Globe Piano Music Festival competition in London where he won the 1st prize in his age group category. Encouraged by his success, Alexander took part in the competition in the years that followed and continued to win in his age category ever since. He also holds several prizes for the regional EPTA UK piano competitions held annually. Alexander dedicates a lot of his time to music and in addition to piano lessons, he is learning to play clarinet with Tim Bailey. Inspired by his grandfather who is a celebrated film and theatre actor, Alexander attends drama classes at the York Theatre Royal. In the Showcase Recital on 5 April, Arthur will be performing The UFO (All The Fun Of The Fair piano suite) by Lindsey Berwin and Lovebirds (Birds Études-Tableaux) by Andrew Higgins. Arthur is nine years old and he is Alexander’s younger brother. Arthur’s piano lessons started when he was six years old and since then he loved performing in public recitals around his home county of Yorkshire and in London. His regular public appearances paid off and in 2017, he became his age category winner at the Around The Globe Piano Music Festival (AGMPF) in London. In addition to his piano lessons, Arthur is dreaming of becoming a composer. With several pieces under his belt, he is looking forward to showing them to the EVC Music composer Lindsey Berwin (All The Fun Of The Fair piano suite) during the masterclass at the Elena Cobb Star Prize Event on 5 April. And like so many boys of his age, Arthur enjoys playing football with his friends in his spare time. In the Showcase Recital on 5 April, Arthur will be performing Gavotte (Album For The Young) by Irina Nenartovich (EVC Music). Adam is a very talented fourteen years old pianist who currently studies the piano under Professors Planinka Jurišić Atić at the Konservatorij za glasbo in balet Maribor. He is also a ninth-grade student at the Tone Čufar in Maribor Elementary School. For the first five years of his music education, Adam studied the piano with Professor Saša Gerželj Donaldson and Professor Urška Roškar. In February 2017 Adam has successfully passed his entrance exams for the gifted students’ programme led by Professor Zoltán Füzesséry at the prestigious University of Music and Performing Arts Graz (Kunst Uni Graz) in Austria. In the past, Adam was also fortunate to attend piano lessons and masterclasses with distinguished piano pedagogues Zuzana Niederdorfer, Arbo Valdma, Aris Feslikidis, Jasminka Stančul, Đorđe Milojković, Nikos Zafranas and Nataša Veljković. At the Winners Concert at the Royal Albert Hall on 5 April 2018, Adam will be performing a world premiere of the Albatross from the Birds Études-Tableaux (EVC Music) by Andrew Higgins. I am delighted to present to you these two fine young musicians from the UK who won Elena Cobb Star Prize award at the Richmond upon Thames Performing Arts Festival in March 2018 in the Piano Duet category. In the festival, Lily and Ivan played Mrs Van Der Blond by Elena Cobb, a show-stopping boogie-woogie number which earned them their place and the invitation to perform at the Winners Recital at the Royal Albert Hall, Elgar Room on 5 April. Richmond Festival is a member of the British & International Federation of Festivals. I would like to thank the committee of the festival for including Elena Cobb Star Prize classes for the second year running! Lilly is a 13-year-old girl who absolutely adores playing and listening to music. She has been playing the piano with her teacher Antonietta Notariello since she was 4 years old and has always been very enthusiastic about it. Lilly is visually-impaired having been diagnosed congenital glaucoma and music has been joy in her life. She enjoys playing chamber music because it gives her a chance to play with other talented musicians whilst making lots of new friends. She has played in piano trios, duets and quartets at the Royal Academy’s Primary Academy where she studies piano and violin on Saturdays and at music summer courses with her friends. Her current repertoire includes the Clara Schumann piano trio and Mozart Variations in G major K501 piano duet. Her playing is filled with lots of colour and musicality and she is very much looking forward to playing Mrs Van Der Blond at the Elena Cobb Star Prize Concert, with Richmond Festival duet partner Ivan Rodriguez Deb. 2017 The best piano performer in the 12 years and under section at the Ealing Festival. 2017 The most impressive performer at the West London Pianoforte Festival. 2018 Mozart Duet and solo performance at ‘the New Year Entertainment’ Charity Dinner at the Normans Field Theatre in Teddington. 2018 Advanced Solo and the Duet Winner of the Elena Cobb Star award at Richmond Festival. Lilly currently has ABRSM Grade 8 Distinction for Piano and Grade 7 Distinction for Violin. She is looking forward to playing violin in the Quartet and piano duet with Ivan at the Amber Trust Award Concert featuring Derek Paravicini in May 2018. 12-year old Ivan began playing the piano at the age of 9 with piano teacher Olwen Morris at Watford School of Music. During this short space of time in which he has achieved ABRSM Grade 8, his passion for music making has enabled him to make up for lost time. His progress has been acknowledged by The Amber Trust, a charity which financially supports talented visually-impaired musicians with their music learning. Ivan loves playing anything and everything from Baroque to Boogie Woogie and has thoroughly enjoyed preparing Elena Cobb’s duet Mrs Van Der Blond with Lilly Kurata, their performance winning the Elena Cobb Star Prize at this year’s Richmond Festival. Besides his love for the piano, started learning the cello three years ago. He plays in the String Sinfonia Quartet at Watford School of Music and has just taken his ABRSM Grade 5. His achievements have been recognised in the form of an invitation last year to play with the musical prodigy Derek Paravicini and his quartet. Ivan has been invited to join him again this year at the Amber Trust Award Concert where he will be performing a Mozart quartet piece with fellow musician Lilly as well as their winning duet by Elena Cobb. 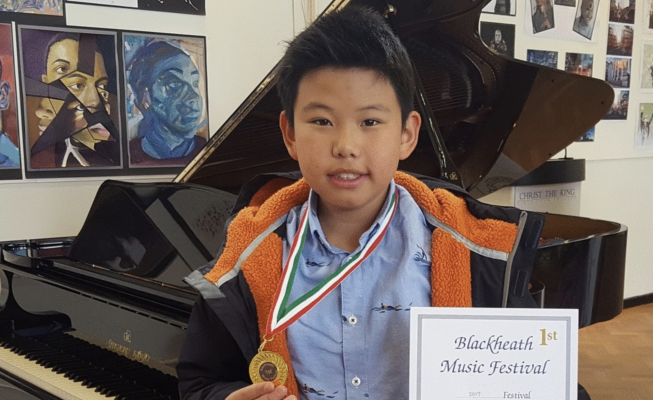 Ivan is now enjoying performing in more festivals, learning his first full Beethoven sonata, and working towards the ARSM exam. Lauren is currently a third grader at St. Simon the Apostle Catholic School in Indianapolis in the United States. She started her piano studies under Mrs. Irina Gorin in August of 2016. Irina Gorin is the author of the immensely popular piano teaching method for beginners Tales of a Music Journey. Lauren is performing Polka Butterfly from Higgledy Piggledy Jazz by E.Cobb at the Carmel Klavier International Piano Competition USA. Lauren has played in multiple musical recitals and has also performed at her school and church. 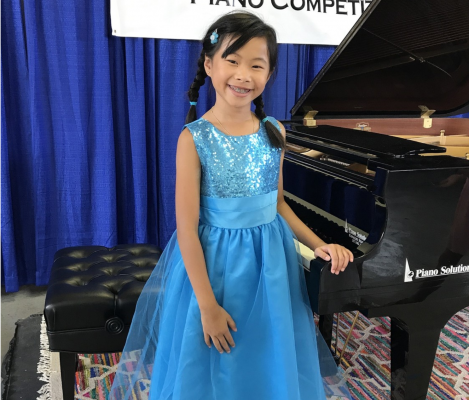 In 2017, she was a finalist and placed third in the Young Hoosier State Piano Competition. She has also won several awards at the 2017 Carmel Klavier International Piano Competition including the Featured Composer Award sponsored by Elena Cobb. Lauren is thrilled to be playing at Royal Albert Hall in London. In addition to playing the piano, Lauren enjoys playing the violin and singing in the school choir. Her other interests include cross country running, drawing, reading, and in 2015 she earned her black belt in karate. She enjoys spending time with her two older brothers and her dog, Po. Alanna Crouch is a ten years old girl who lives in Romford, UK and she began playing the piano when she was three. Alanna is quick to let people know that she shares her December 16th birthday with Beethoven who, along with Gershwin is one of her favourite composers. Alanna performed her first Mozart piano concerto in Barbados when she was five and enjoyed the experience so much that she has jumped at the opportunity to perform ever since: from impromptu performances at local hospitals and the Street Pianos around London to more planned performances at competitions, music festivals and concerts at venues including Frank Collymore Hall in Barbados, Steinway Hall UK, Carnegie Hall. When she is not playing music on the piano or violin Alanna enjoys Science, making figurines out of clay and drawing. At the age of seven, Alanna sat the ABRSM Grade 5 Jazz and ABRSM Grade 8 exams and attained high distinctions in both. At the age of eight, Alanna was the youngest person to pass the DipABRSM when she sat. In the video, the world premiere of Débutante Grande Valse by E.Cobb at Alanna Crouch solo recital at Steinway Hall UK on September 27th, 2017. My name is Minerva and I was born in Tuebingen, a medieval, beautiful city in Southern Germany… I like music because it can exist in any emotion. I started to learn to play the violin when I was four and piano when I was five. My first piano teacher was Mrs. Heidrun Hamp, who was also a great singer and composer. I moved to the USA along with my family when I was six and luckily for me, I met my current piano teacher, Mrs. Irina Gorin, who is fantastic and I am enjoying playing the piano even more than ever! Irina Gorin is the author of the immensely popular piano teaching method for beginners Tales of a Music Journey. Minerva performs Sentimental Waltz by Maykapar in 2016 Carmel Klavier International Piano Competition semifinal. My hobby is to write poems, music and to draw. My favorite piano pieces are Waldeinsamkeit, Der Nussbaum and In dreams. When I grow up, I want to be an artist. Wilson is another talented young pianist who received an invitation to perform at the Winners Recital at the Royal Albert Hall, Elgar Room on 5 April 2018 where he will be performing Good Mood Boogie Grooves for Piano Dudes (EVC Music) by the award-winning British composer Heather Hammond. He was born in London and his family is originally from Hong Kong. When he was five, he had his first piano introduction lessons during the summer holiday in Hong Kong. Since then he loves the piano. He started his formal regular piano lessons from January 2016 and actively participates in piano competitions. Besides playing piano, Wilson enjoys reading books, doing magic tricks, solving the Rubik’s cube, swimming and playing tennis. Both James and Alex Giannopoulos currently study with their Mum, Liz Giannopoulos, who is the founder and director of Encore Music Tuition, a thriving piano school in SW London. The team of eight Encore Tutors share a love music, a passion for teaching and unwavering commitment to delivering the highest quality tuition to every student. Together, they coach more than 140 piano students on a weekly basis. In addition to giving private piano lessons in her music studio and at local primary schools, Liz uses her experience of teaching and learning to coach and mentor the team of Encore Music tutors. James is a 13 year old enthusiastic piano student who has been learning since the age of 6. He plays with a maturing sensitivity and a delicate touch which is well suited to the Romantic genre, although he is particularly drawn to contemporary music and is delighted to be showcasing Fourth Street from Sam Wedgewood’s ‘Project’ published by EVC. Alex has just turned 8 years old and as a developing pianist he is full of energy, creativity and curiosity. He enjoys experimenting with the piano and can often be heard developing the pieces he is learning by adjusting the tempo, varying the octaves or harmonies and adding the sustaining pedal for dramatic effect. He is a keen improviser. Having recently participated in student feedback research for ABRSM he is delighted to be showcasing his favourite selection from the new Piano Star Grade 1. Alex is eagerly awaiting the results of the ABRSM Grade 1 exam he has just completed. 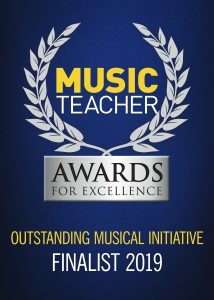 It goes without saying that music plays, (pun intended) a very important role in every child’s life and the Gibraltar Festival for Young Musicians’ team, led by Cathy Batchelor and Christian Santos and supported by the Government of Gibraltar, have certainly achieved their goal in providing an important showcase for developing musical talent and creativity in young generations to come. The 10th Anniversary Gala Concert which I attended back in 2014 as a guest composer was the amazing array of a musical talent on every level was a real treat. Young musicians performed with confidence, poise and virtuosity. The level of performance in the Elena Cobb Jazz class was very impressive too and I want to congratulate the winners in each category: Michael Dowry (Elementary class), Karizma Daswani and Reena Nagrani (Junior Class), Stéphane Dominicy (Senior class) and every performer with their success. The tunes from ‘My Piano Trip To London’, ‘Higgledy Piggledy Jazz’ and ‘Blue River’ were full of glee and full of swing! Please continue reading the story on my website. Reena was born in Gibraltar and has just turned 14. She started playing the piano at age seven and is a student with the Gibraltar Academy of Music and Performing Arts. Her other interests include Girl Guiding, Swimming, Ice Skating and Stagecoach, where she is coached in singing, acting and dancing. 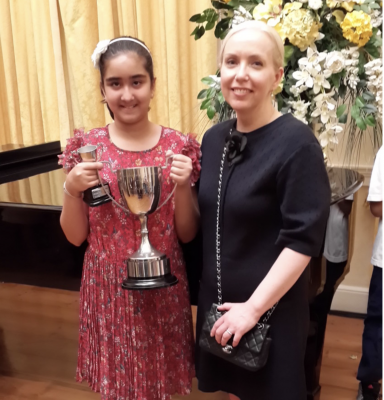 On the photo: Reena with the Elena Cobb Star Prize Trophy and Elena Cobb at the Gala event in 2014. 2017, Completed up to Grade 5 theory and practical ABRSM exams. Phoebe is currently a year 2 pupil at Naburn Primary School in York, UK. She started playing the violin at the age of five and when she turned six, she began her piano lessons under Heather Hammond (Soundabout Music Studio), who is also an award-winning composer published by Faber, EVC Music and Kevin Mayhew Publishers. Needless to say that under her teacher’s guidance, Phoebe has blossomed and become a keen performer with regular appearances at Soundabout Music Studio and EPTA UK concerts. In the Showcase Recital on 5 April, Phoebe will be playing Toreador’s Tango by Heather Hammond from Piano Olé! (EVC Music). As well as being an avid reader and Harry Potter fan, Phoebe enjoys swimming and gymnastics. 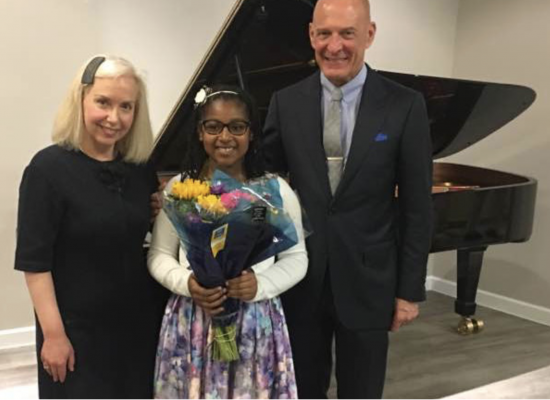 Three young and talented pianists from the sunny Boynton Beach in South Florida, USA will be joining an International team of performers at the Royal Albert Hall in London on April 5 at 11 o’clock. Masha Smelik (12 yo), Reid Collins (14 yo) and Jude Fradillada (13 yo) are all students of Kay Lang and currently attend piano lessons at the Doremiforme Piano studio. Jude is having piano lessons for only 4.5 years and while he is a very dedicated student, he is planning to become a surgeon. In his spare time, Jude enjoys reading about history and art. He also never turns down a chance to attend a classical music concert. As a finalist of the Carmel Klavier International Piano Competition 2017, Jude received an invitation to perform at the Winners Concert at RAH. Masha is a happy teenage girl who loves her piano lessons and takes every opportunity to perform in public whether it is a concert at school, a charity event at the local community or a competition. When she is not practising her scales, Masha rides horses and enjoys taking part in the equestrian events. Masha is particularly excited about her appearance in the Showcase Recital as it will be her first visit to London. A fourteen years old Reid is the 8th Grade students at the Bak Middle School of Art where he studies the Advanced Master Piano programme. His music education begun when Reid was six years old and since then, he always enjoyed performing in public. Reid also loves math, history and he is a keen basketball player. Invitation to perform at the Showcase Recital presented Reid with the opportunity to visit London for the first time which makes the trip even more exciting. Meet Kaylea Childs, a young pianist from Essex who will be performing Time To Catch A Train by Elena Cobb from a bestselling book Higgledy Piggledy Jazz (EVC Music). Kaylea received her invitation to perform in the Winners Recital after winning in the Elena Cobb Star Prize category at the Southend Musical Festival in 2016. Kaylea was born in Singapore and moved to the United Kingdom in 2010. She started learning the piano and violin at the age of 7 and achieved distinctions in violin, piano and theory exams. She started competing in festivals at 9 years old and since, has won 8 violin and 8 piano golds and trophies, including the Elena Cobb Star Prize in 2016. 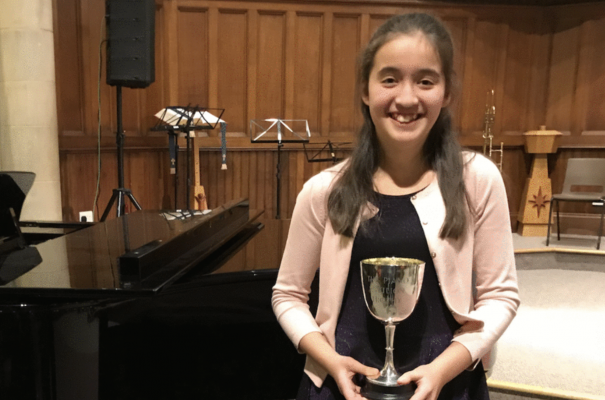 She has since gone on to win the coveted Piano Pavilion Trophy (overall prize for the most promising junior piano soloist for under 16yrs) at the Southend Music Festival 2017 at age 11. Kaylea is a member of the Essex Young People’s Orchestra, South Essex Youth Symphony Orchestra and Southend Youth Orchestra. Apart from the piano and violin, Kaylea learns the guitar and loves musical theatre and singing. 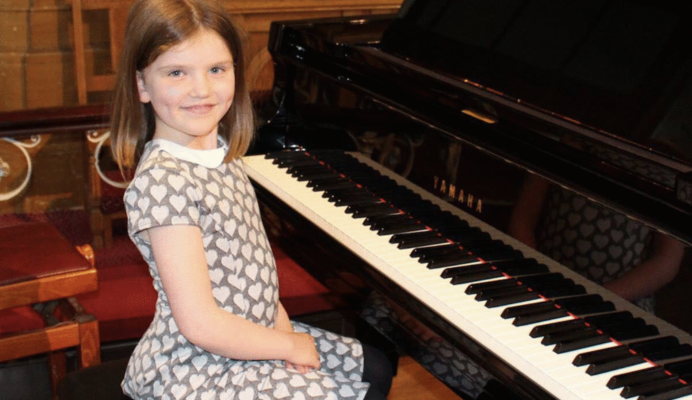 Elena Cobb Star Prize event was created to give children without the specialist music education an opportunity to perform at the Royal Albert Hall and to encourage and promote their love for piano. I am delighted to say that the Berkshire Music & Arts Festival 2017 Elena Cobb Star Prize winner Siddhanth Tekurkar from Reading will be playing at the RAH concert on April 5th and I am looking forward to his performance of the very popular piece Star Dust from the Blue River collection. Interestingly, Siddhanth started his musical journey at the age of seven when his mother took him for Piano lessons after learning about its overall brain development benefits. 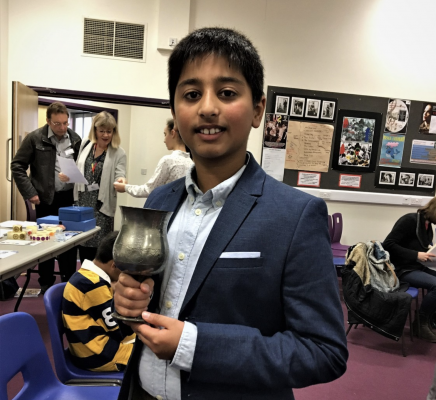 Siddhanth latched on to the Piano early on and was able to progress through the grades very quickly achieving distinction and merit in the ABRSM exams. His Piano teacher Jo Dolman recognised his talent and encouraged him to perform in music festivals during the last couple of years where he earned many accolades. Apart from Piano, Siddhanth is passionate about Cricket and his favourite subject at school is Mathematics. His teachers describe him as a ‘Sponge’ with an ability to absorb and retain any information very quickly. Siddhanth started his secondary school last September at the Reading Boys Grammar School where he achieved entry through high marks in the eleven plus entrance test. His parents hope he continues his pursuits in music, sports and education towards a balanced and fulfilling life.